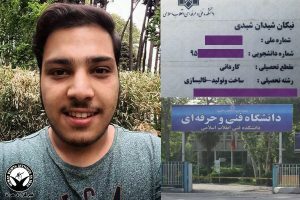 Human Rights Activists News Agency (HRANA) – Just shy of obtaining his associate’s degree in industrial mold making, Baha’i student Nikan Shaydan Shidi has been expelled from Tehran Technical University for refusing to denounce his faith. While Iranian Baha’is are routinely banned from pursuing higher education, some manage to surpass initial barriers to enrollment, only to be thwarted before culminating their degree. On September 15th, HRANA reported on the expulsion of Baha’i architectural design student Shaqayeq Zabihi Amrii from Rassam Private University of Karaj. Baha’i students are often prevented from enrolling in college altogether during the processing of their results on the nationally-competitive college entrance exam known as “Concours.” Over the past few weeks, more than 51 Baha’i students were stopped short of applying to universities, purportedly due to “deficiencies” in their admissions files. In its close coverage of these most recent cases, HRANA published specimens of the documentation used to block these Baha’i student files from further processing. In direct violation of the law, Baha’is are prevented from pursuing degrees or employment in government offices, per under-the-table directives from the Supreme Council of the Cultural Revolution. Every year, a new cohort of Baha’is is barred in this way from the university enrollment process. Since the 1979 revolution, the office of the United Nations Special Rapporteur on Iran has repeatedly protested the Iranian government’s animosity towards its Baha’i population, particular in preventing these citizens from furthering their studies. According to the Rapporteur, such directives demonstrate a blatant disregard of multiple international treaties.